It was the second night of the school play. 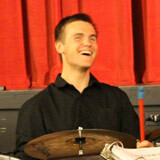 The show was called Crazy for You, a collection of jazzy Gershwin tunes, and I was on drums. I was ready. There was only one problem: I felt sick. Somewhere in the acidic underbelly of my fleshy bits, my BBQ ribs from lunch churned a little. I excused it as nothing and strode over to my flashy drum set that I got from Drums Dude, in the orchestra pit as the lights dimmed for the beginning of the show. I sat down and felt a little wave of nausea again. I turned to my orchestra buddy and whispered, “Bro, I feel kinda sick.” He whispered back, “You’d better not throw up on me, man,” and the show began. I don’t mean to flip my own sticks, but the first act was great, both up onstage and down in the pit. It was like I was a drumming Buddha. But as the house lights brightened for intermission, my nausea was overwhelming. I had never been scared while playing drums before; I had performed in front of crowds hundreds strong dozens of times. Yet I was genuinely worried I would ruin the show by vomiting everywhere and letting my dad, the orchestra, the actors, and the entire audience down. I felt out of control. The Pepto was more useless than Benedict Arnold was to the Revolutionary Army, and (spoiler alert) it ended up stabbing me in the back just like Arnold. The contents of my stomach had started a revolution, and the BBQ ribs were General Washington riding through my intestines on a corn-bread steed. The Pepto soon defected and joined the revolt, making me sicker than before I drank it. Vomit was imminent. The only question was how long I could hold it off. I snatched up the trash can and threw up into it. In my mind, the audience was staring at me, the spotlight operators had swung their lights over to shine on me, and a small village somewhere in Kenya shook a little with the resonating sound of my vomit. In reality, though, only the two people closest to me in the orchestra noticed — because I kept the drumbeat going the whole time with my feet. Then I set down the wastebasket, picked up my sticks, and found my place in the sheet music again. After the show, I stumbled to the car but couldn’t avoid all the orchestra members and the show’s director — who surprised me by telling me how “rock and roll” that was. I had expected to be ridiculed and called “barf boy” for the rest of my high school days. Instead, I became known not as the kid who threw up during the school play, but as the kid who threw up and kept playing. At the end of the year, I was honored by my band director in front of 300 parents and students and received the school’s prestigious Orchestra Award. My name is engraved on a plaque that hangs in the band room for future students to see. While we all hope things go as planned, it’s the times when things go completely unexpectedly that make us who we are. Yes, I threw up in a trash bucket in front of an audience, but in exchange for the embarrassment, I got a great story, a reputation of resilience, and a lesson: When failure is imminent, don’t back down. Just keep on going. Maybe in the end, that’s worth a little Pepto-Bismol.